Hamilton Island Race Week is the ultimate combination of spectacular island racing and evening fun ashore. 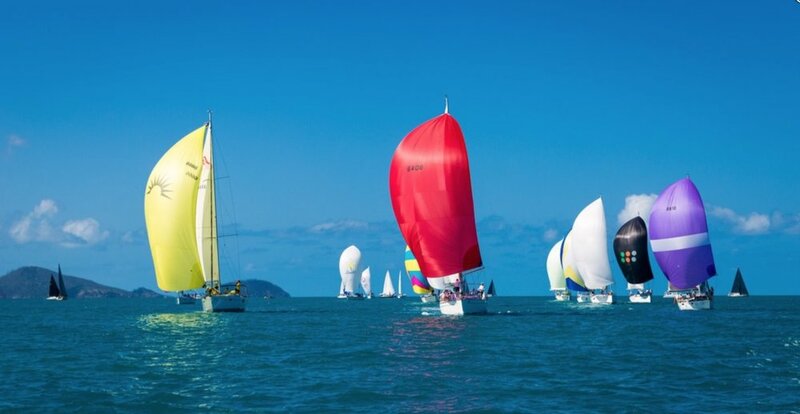 Set on Hamilton Island in the Whitsunday Islands, the race week spans 6 races around the island over 7 days, with a fun filled lay-day in the middle. With more than 200 yachts racing in sparking blue waters, filled with whales, turtles and dolphins, its is my favourite annual regatta. Join our racing crew of 10 for a week of exhilarating racing, great team spirit and exceptional social events. From trailer yachts to 100 foot super maxis, Hamilton Island Race Week is Australia's premier yachting regatta. Join the Ocean Gem crew to compete in a division of 20-25 highly competitive production yachts that are 45-55 foot in length. Check out photo gallery highlights from Hamilton Island Race Week 2017. Check out photo gallery highlights from Hamilton Island Race Week 2018. You'll fly into Hamilton Island directly or into Airlie Beach (Proserpine) and catch the ferry to Hamilton Island on 16th or 17th August. We'll be completing final regatta preparations during this time, allocating crew roles and checking weather forecasts as the excitement and buzz in the race village builds. With 200+ boats and 6,000 regatta crew and family members arriving for race week its an amazing festival of sailing and activity ashore. Race one kicks off on Sunday 18th August with the next two races on Monday and Tuesday. Wednesday is a day off and we'll head to the beach or an island for a day of social activities. Races four to six take place across Thursday, Friday and Saturday and your week comes to an end with the Hamilton Island Race Week prize giving dinner on the Saturday night. Results are announced ashore daily at 5pm followed by a trip to the bar for a debrief of the days result before heading to dinner. We squeeze in the All Blacks vs. Wallabies rugby test matches on the big screen on both Saturday evenings and every night we'll go ashore as a team (dressed in our offical crew shirts) and hit the town. You'll fly out of Hamilton Island directly or out of Airlie Beach (Proserpine) on the 25th August and head home with a hole in your heart, swearing you'll be back next year to do it all over again. Your crew package includes; all breakfasts, all lunches onboard, accommodation onboard, your Ocean Gem racing shirt and your Ocean Gem crew shirt, marina fees, race entry fees, the use of a PFD (personal floatation device), PLB (personal locator beacon), and a safety tether. Your bedding, a pillow and towel is also included along with suncream. Your crew package excludes; accommodation ashore, meals ashore, flights and transport to and from departure and arrival ports, alcohol, toiletries, clothing and wet weather gear. Some crew will sleep onboard and others will stay ashore. Its always recommended that you book flights with date flexibility incase of unforeseen changes due to weather or schedules. Accommodation options if you want to stay ashore: AirBNB, Booking.com, Wotif & HomeAway.